Lucy Robinson has been making me howl with laughter for a little over a year now. She bravely ate Twizzlers and Twinkies at my request when she went to America and her reaction nearly made me wet myself. Her books are brilliantly witty and observant. Her use of swear words (some she even makes up!) is hysterical and she never holds back. I had the huge pleasure of meeting Lucy at the Sunlounger 2 author/blogger event last May and she was an absolute gem to be around. 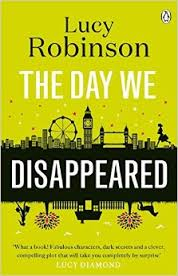 The Day We Disappeared is her 4th novel and is available now. Everyone has been buzzing about this book for weeks now. They were talking about this huge plot twist that totally surprises you. They were right to talk about it. It hit me like a tonne of bricks, even though I knew it was in there somewhere, I had no idea what or when. And when it hit, it hit hard. Annie is a great character. She's sad and untrusting and just wants someone to love her and make her feel whole again. There's nothing wrong with that, it's what a lot of people want, especially those who have suffered a trauma like Annie has. She's got a lot of fight left in her, though she doesn't believe she has. Her friends, "Le Cloob" are amazing. I loved each one of them. Lizzy is the kind of sister I wish I had. And their father is just the sweetest thing ever! Kate is feisty but scared. She just wants to start all over again somewhere no one knows her. She has run from something in her past but won't reveal it to anyone. She looks for a new start in a completely different life from the one she left and finds it with Mark, Becca and Joe. The life she starts to build there is so far removed from her previous life that she starts to heal. I loved Kate for her fiery Irish ways, her hilarious banter with Joe and her affection for Stumpy the horse. She sounds like she'd be a brilliant friend. The two stories told here are intertwined beautifully and the whole book is so smooth and easy to read. I was captivated and curious throughout. Whilst the twist packed a punch, the ending was exactly what I'd hoped for and made me weep. This is chick-lit with a difference and I would urge anyone to read it! I will be passing this on to a friend who mainly reads Crime novels as I'm curious to hear what she would think!